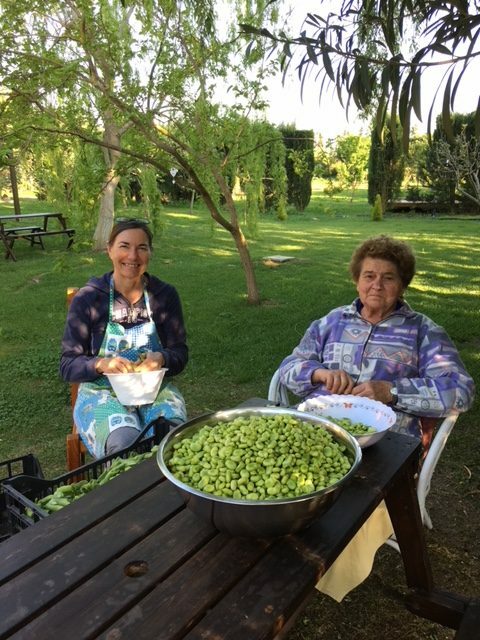 This year I collected 5 cases of organic fava beans, tender and sweet. My Mum helped me to peel them, I will freeze a part of them, to eat them in autumn, I cook them with fresh onion, extra virgin olive oil, and salt, two quails of water to keep them soft during cooking, at the end of cooking add fresh eggs,( I recommend organic), even when the eggs are cooked the dish is ready to eat with good bread, naturally leavened. The second part of Fava beans I keep them in glass jar, in virgin olive oil, after having cooked 3 minutes in half vinegar and half white wine, salt and rosemary.